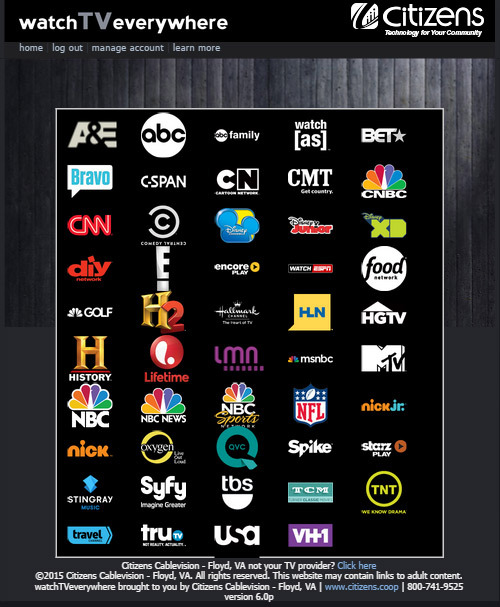 WatchTVeverywhere is the streaming of some of your favorite TV channels to your mobile devices. As a Citizens digital TV subscriber, watchTVeverywhere is FREE, accessible on your laptop, tablets, and other handheld devices like an iPod or SmartPhone. Log in today, with your Citizens account number, select Citizens, Floyd VA, as your provider and start enjoying TVeverywhere. More information about TVeverywhere is available here.